We've just added Mystic spars, bridle components, end caps and other replacement items to the website. I tried to send you a message on the Kite Forge site but got an error from the site that message failed. I had a failure of the leading edge center spar connecting pin on my Djinn VT. The pin pushed into the spar all the way. 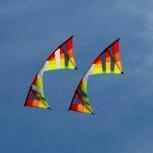 I am seeing that the wrap is not as tightly spaced on this end vs my other Djinn kites. I got this last week and have flown it twice in 12-17 mph wind. No hard landings or crashes. When I went to assemble it today I found that the pin was pushed into the spar. How to proceed? Is this something you would replace or do I need to buy a new one? I'd be happy to send you the spar. I'm leaving for the East Coast in 10 days and would like to take this with me so if we can work a plan to get it before I leave, that would be great. If not, I can work around it. The "pin" is called a ferrule. That image looks like the ferrule was pushed into the spar. Getting them out can be tricky, since both ends of the center spar have ferrules in them. On many other kite styles, a spar with a single end ferrule you can push it out from the other side, but the Hadzicki wing style's center spar is tricky because both sides have ferrules. You might glue something to the end of the ferrule, then when the bond is solid, pull the ferrule out. I'm sure there are other ways to extract them from people with more experience than me. They can be superglued back in place once extracted. Or they can be pushed into the spar, forever trapped inside as you glue a new ferrule over the end. In the future, affix the ferrules to the outside tubes instead of the center one, it breaks down shorter length overall and you'll never have this experience again! 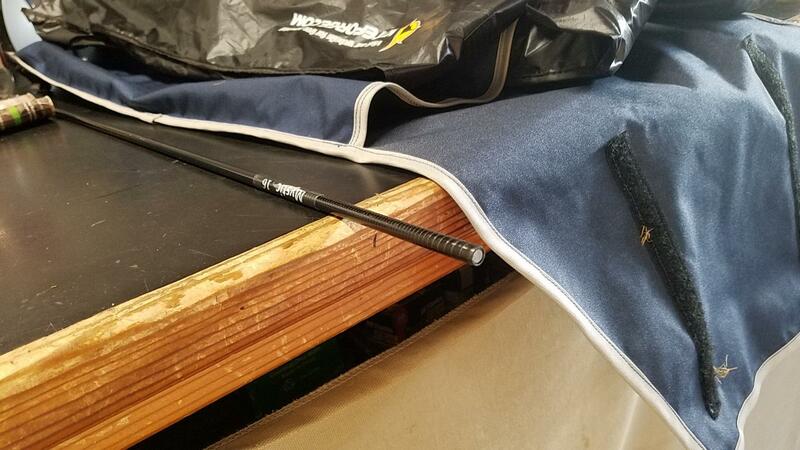 "Feel along the spars" during assembly, to insure this doesn't happen on other kites. I carry a long skinny (point 125" carbon) tube to push thru the leading edge members, if necessary. There's no easy solution to the tube you cannot currently use. I carry spares but that doesn't help you. See if the other side can be loosen up and removed entirely. Then push out the stuck ferrule with a carefully straightened-out coat hanger? Out of curiosity, any reason why superglue wouldn't work for re-attaching a ferrule? I know not to use certain types of glue, such as the expanding Gorilla Glue since the stuff can cause a spar to swell up, but I've used superglue (cyanoacrylate) for them at the recommendation of people here and elsewhere. Acetone (nail polish remover) will dissolve cyanoacrylate glue, making it easier to clean up in case of drips, or to remove an already-placed ferrule. Building up the stopper thickness with electrical tape makes a nice clean bonded edge (also prevents over insertion), as it just removes the excess epoxy overflow as unwrapping takes place. Wait for it to dry first!!! I carry a repair kit, you can bet both kinds of adhesive are in there too. But if I can wait until I get off of the beach I can do it right! Placing the ferrules into the outside pieces of the leading edge assembly just seems like a no-brainer to me. No "both ends sealed with solid ferrules", also the kite "breaks down shorter" (my A-bag is an oversized fishing rod case from Orvis). Lastly, on a personal level, I run a different bridle from most folks so my kites bend on the other 3rds instead of in the middle, therefore I also prefer a varying degree of flex in the LE. That is accomplished by use of a travel frame layout with stiffer members in position two and five from the other 4 spots along a six piece leading edge. Usually green race (2) and diamonds (4). for convenience these tubes are taped together in pairs making a three piece LE. I want more stiffness at the intersection of the down spars and LE. Having the ferrules on the outside 2 LE pieces makes changing the flex easier for me on site. I will grant that I do almost nothing as others do, I've spent lots of time experimenting and testing for my own preferences,... over decades in fact. The great thing about kiting is .... "you take the best and dump the rest!" As you'll hear hundreds of ways to get to your promised land.